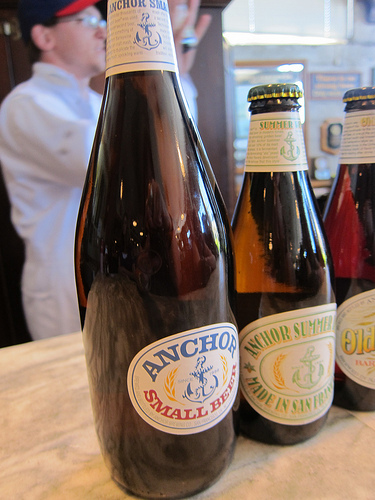 While in San Francisco, I had a chance to tour the Anchor Brewery. They offer free tours twice a day during the week. 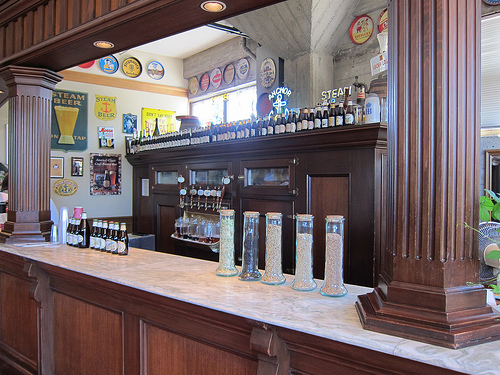 We learned the history of San Francisco’s original craft breweries. 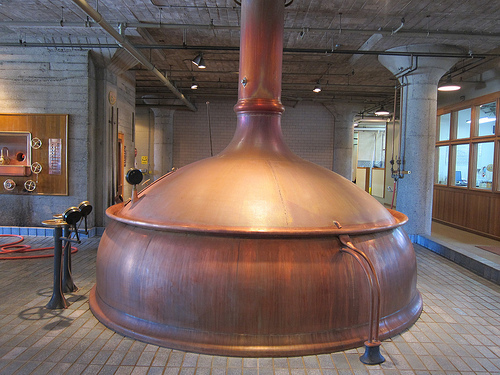 All the beer they make comes from the brewery which is housed in an old coffee roaster building. Anchor also has a small distillery on site. 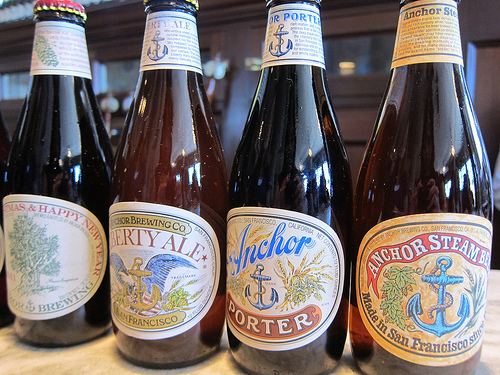 Anchor Steam comes from the term steam beer where the brewery brewed without refrigeration. 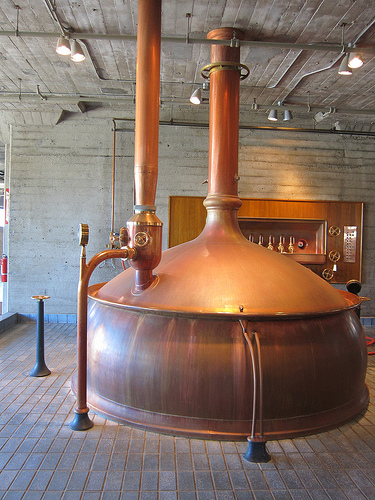 Anchor would lay out the shallow vats on the roof letting the frigid San Francisco nights cool down the beer. Steam was seen rising in the night. We met up in the taproom where we looked at the memorabilia and were promised we would get to try the beer after the tour. I had my eye on the porter. We looked at the shiny stills, the rooms with hops then down to the slightly damp brewery before heading up to the clean bottling room. It was the late afternoon so most of the workers had left having been at the brewery quite early in the morning. We trooped back over to the taproom to get tasters. There were quite a few beers to try so I opted for half tasters (about 2 ozs). I really loved the Small Beer. It had tons of flavor and was almost syrupy. 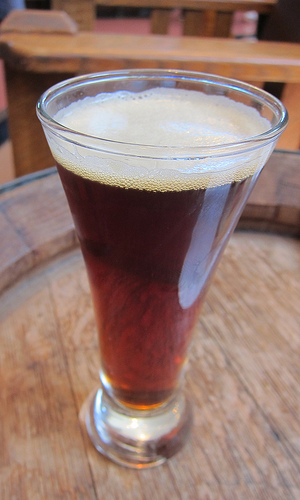 Anyone who prefers pale ales or lagers probably wouldn’t care for this too much. It was a pretty fun tour and you got to see quite a bit more than say the Samuel Adams tour in Boston. And you certainly got to taste more. In this regard, West Coast vs East Coast? West Coast, hands down. This entry was posted in alcohol education, alcohol tasting, beer, events, history, travel and tagged anchor steam, anchor steam beer, beer, beer brewery, beer brewing, brewery, brewery tour, brewing, craft beer, san francisco, sf, the minty, tour, travel. Bookmark the permalink.